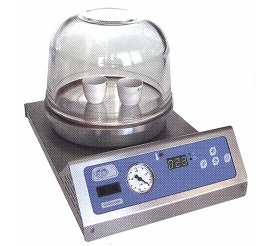 The heated Vacuo-Temp Vacuum Desiccator has an AISI 304 stainless steel outer casing with a polished aluminum alloy flat heating plate. A tempered glass bell jar and a silicon gasket provide an effective vacuum seal. The easy to use control panel has simple controls and displays, including an analog vacuum gauge, digital time and temperature display, visualized parameter indicator, and buttons to display or change the parameter. Vacuum pump connection is at the back of the unit along with a vacuum bleed valve. There is a temperature thermic limiter and an overheating alarm.